Sometime before 1865 a new cemetery was formed on the Heads Road, in what is now the Patea Golf Course (Harbour Board Reserve Land) adjoining the Domain. It wasn't used for long and all record of who & how many people were buried there has long since been lost. The Battle of Te Ngaio was in March of 1865, and this heralded the first burial at the Scotland Street Cemetery of a soldier killed in this battle. The area of Te Ngaio runs from the cemetery, on towards Kakaramea. It is unknown where the 80 Maori killed in that battle are buried. The second burial was in 1869 - Margaret Sergeant. Another very early burial is Charles Broughton. He was killed on the 1st October 1865 at Otoia and was buried by the Patea River in the area the boat ramp is now located, where his body was found. He was re-interred in the Patea Cemetery by the Borough Council in 1937. 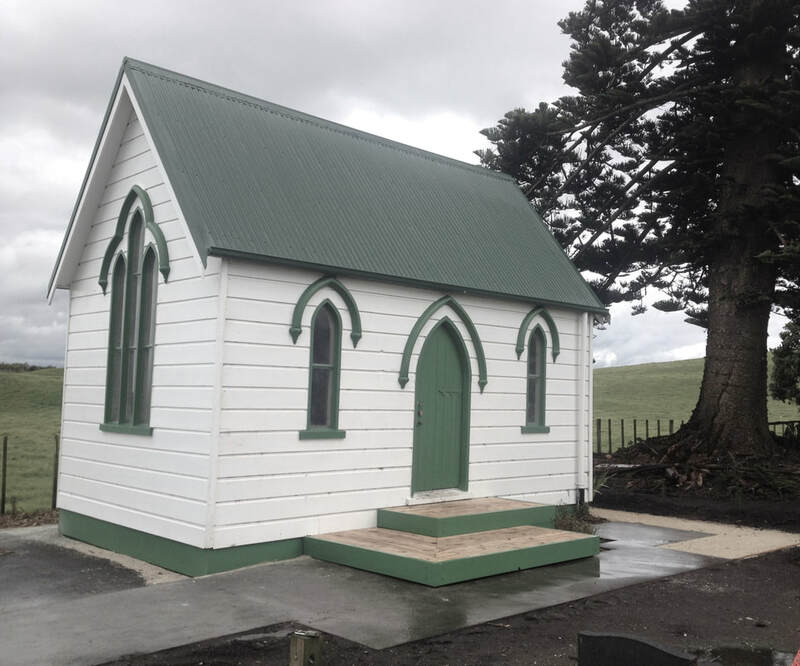 Archaeologist & Heritage Taranaki President Ivan Bruce, has done extensive research on the 8 burial plots on the top of the hill at Patea Cemetery on Scotland Street. He found newspaper articles stating that Private Robert Bates wasn't killed at Te Ngaio, & therefore "The possibility exists that Private James Nixon (who was killed at Te Ngaio) and Private Bates have been confused and it was indeed Nixon that was reburied at Lot 17 of the Patea Cemetery, he was as far as I can establish the only European Soldier killed at Te Ngaio". After the Storm in 2012 the Pine Plantation on top of the hill above the Scotland Street Cemetery was removed, & the 3 remaining Headstones were able to be seen again. Plot 13: Dr Archer Charles Croft, died 26/4/1886, aged 61. . It is said he was descended from an English aristocrat, & had arrived from England in 1852, settling in Christchurch. He opened a Brewery there in 1854. After spending time on the Otago & Thames goldfields, he arrived in Patea in 1874, residing on the corner of Dorset & Leicester Streets. His wife had died giving birth to a stillborn son, and his daughter died as she was about to join him in Patea. Dr Croft was described as a big, robust man, actively interested in horse racing & cricket. His Medical Practice was 'at all times subservient to his enjoyment of life'. Mounted on his white charger and immaculately dressed, he was a familiar figure traversing the countryside between Hawera and Waverley. He was active on community boards, being a founder member in 1875 and president in 1878 of the Patea Library & Institute, and Chariman of the Foundation Stone Committee for the Patea Breakwater in 1878. He was steward to the Patea Jockey Club, and Surgeon to the Patea Light Horse. Plot 14: Margaret Easton Sergeant, died 31/3/1869 aged 35. Margaret was the wife of Irish Military man, William Sergeant. They had 6 children, when she died in childbirth with the 7th child in 1869. They had been operating a Store on the beach from 1865, for other Soldiers in the area. This headstone was erected by her descendants sometime around 1916. Margaret's daughter Sarah married Harry Locker. The headstone on top of the hill of Margaret Sergeant was erected about 40 years after her death (in 1916) it has commanding veiws over the cemetery, & the sea in the distance. Margaret & William's daughter Sarah married prominent Patea Businessman Harry Locker. Plot 18: Sergeant Boylan, died September 1869, suicide. Sergeant Boylan shot himself while under arrest at Patea and died from the self-inflicted wounds. He belonged to the light Company 65th. Also Two infants. Possibly the graves are located in the vacant area between the gravestones of Doctor Suther and Glanville Holland. The RSA Servicemen's Cemetery was started in 1948. The Mortuary Chapel was first constructed in 1881, then rebuilt using a lot of original timber & features in 1896. It was moved to its new position at the Cemetery in 2013, with the Mountain behind it, & Norfolk Pines at a safer distance. It has recently been restored by the South Taranaki District Council. David Bruce was instrumental in its restoration, & told me there was originally a zinc bench inside where coffins would sit, awaiting burial. Grave diggers equipment was also stored in here in earlier times.